Low-frequency variable air-damped mounts for a high level of vibration isolation. 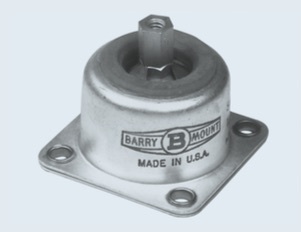 Barry S-Mounts are air-damped isolators and are designed to provide the highest degree of vibration isolation for sensitive commercial and military airborne equipment. S-Mounts are particularly effective at isolating low level vibration. Up to 90% isolation efficiency with inputs as low as 40 Hz. Silicone Air Chambers and Snubbers have operating temperature ranges of -67°F to +300°F (-55°C to +150°C). Mounts meet all applicable standards of MIL-C-172 and are fungus and oil resistant. WEIGHT S22 = 0.5 oz.